08/27/2009 ~ HHD Family Service: a few years ago, while attending HHD services, I observed a mother attending the family service with her bi-racial daughter age 3 or 4. I recalled seeing them at another synagogue. I am sitting a few rows behind the them. The little girl was having a fun time entertaining herself and I was enjoying watching her play. She climbed up in her chair and faced the rows behind her. She smiled at a woman and two teenage girls. The little girl’s entire face lit up as she smiled and I found myself smiling too. Then, quite suddenly, I saw her smile slowly fade. Something was wrong. She lowered her eyes and seemed to be uncomfortable. She then raised her eyes and smiled a big bright smile at the woman and the girls again. And again, I saw her smile slowly fade. But this time she slowly lowered herself to a crouching position behind the back of the chair. My heart sank. I knew what was happening. I felt the little girl’s self-consciousness. I immediately moved up to the little girl’s row. I sat a couple of seats near her mother. The little girl, still crouched down in the chair, was now peeping at the woman and the girls through the hand grip hole of the chair. I looked back at them too. I became angry by what I saw. All three females stared at little girl with unfriendly expressions and cold eyes. The same cold unfriendly expressions that I eventually learned to dismiss. But at that moment, I decided, not this time. This time I stared back for all the times that I hadn’t. I stared back for all of those who wouldn’t; for all of those who couldn’t. And I continued to stare at them until they felt it. I stared until they finally looked at me. I could tell that they knew that I knew what they were doing to the child. I stared back at them until they squirmed in their seats and I was certain they could feel my wrath and see my cold unfriendly, expression that mirrored their own. I turned away, started a conversation with the mother, which in turn attracted the attention of the little girl. She smiled her big bright smile at me, and I smiled back. And everything was alright again. This all took place in less than 5 minutes. The little girl’s mommy never knew. Pesach was lovely! What a rare treat & pleasure it was to spend time with my Jewish sisters of color! We all met on ShalomSistah-Friends, a yahoo discussion group for Jewish Women of Color and we’ve all developed meaningful & supportive friendships. They came in from NJ, Chi-Town & LA. We went on a driving tour of the Philly neighborhoods of East & West Mt. Airy, Chestnut Hill, Valley Green, Germantown, Roxborough, Manayunk, East Falls, drove down Kelly Drive to Art Museum area then back via the long stretch of Broad Street & Germantown Avenue. They are Yofi! Their visit made my Pesach less lonely & more special. 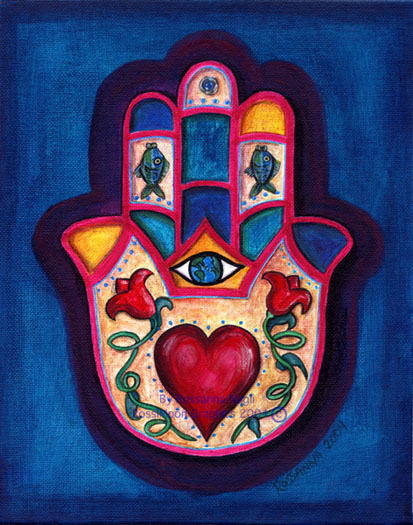 I walked into the jewelry store on South Street looking for silver chains for my hamsa pendants. The storekeeper and I go back and forth about one chain or another & eventually I decide on a couple of them. We have a bit of small talk. 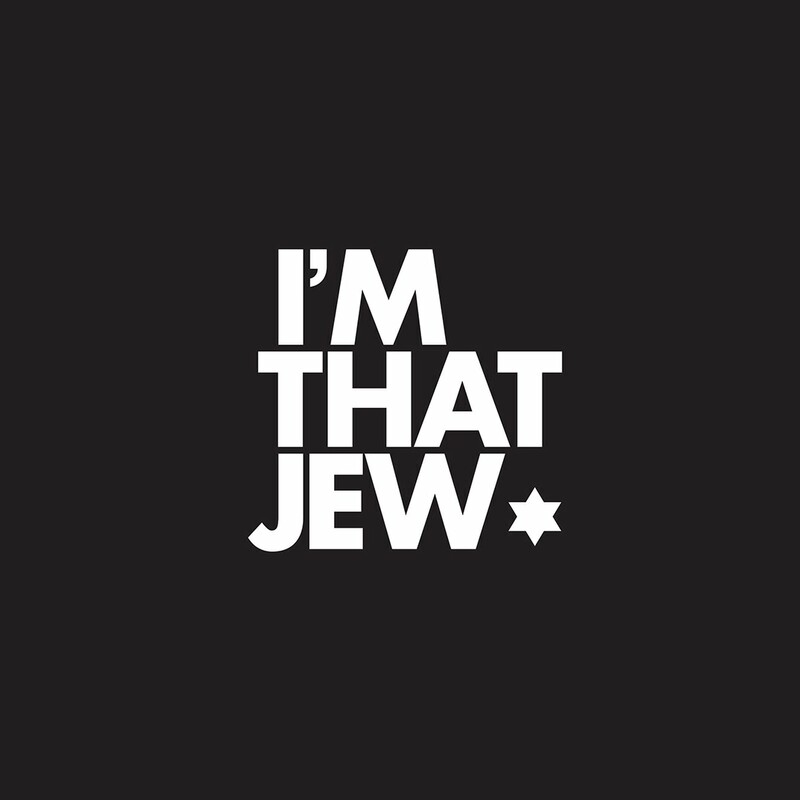 I said something about Israel and he asked, “You’re Jewish?” I say, “Yeasss I am (holding my breath).” And he says, “Me too! I’m from Casablanca. My wife cooks for the Sephardic synagogue.” I’d visited the synagogue he spoke of and tell him, “I know your wife’s cooking! She makes the delicious meatballs for the Oneg,” I also told him she should write a cookbook and that I would buy it hot off the press. He was pleased that I knew of his wife’s cooking and obviously proud of her skills. And I was proud of him, and pleased not be treated with the usual scoff and skepticism. A Jewish businessman was traveling in China. One erev Shabbes he was surprised to find that the city he was visiting had an ancient synagogue. So he hurried to get there before sunset. 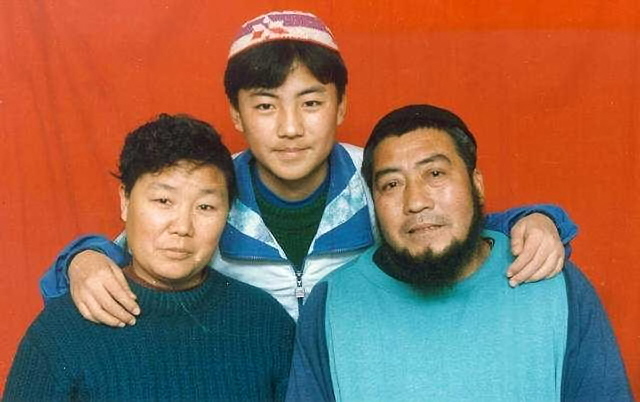 When he got to the shul he was astonished to find out that the entire congregation was Chinese. People stared at him and whispered as he put on his kippa and pulled out a prayer book. (I know. I know. It’s a throw back going way back. But really, think about it. It’s exactly the same thing that Ethiopian Jews said to Prof. Joseph Halevi in 1877 when he “discovered” them. In case you don’t know what the Ethiopian Jews said: When Halevi told them he was Jewish, they didn’t believe him. They said, “You don’t look Jewish.” Ever thought about why they said HE didn’t look Jewish? Because they’d never seen a white Jew. The only Jews they ever saw were Jews that looked like them. Hmmm…sounds like some folks I know). 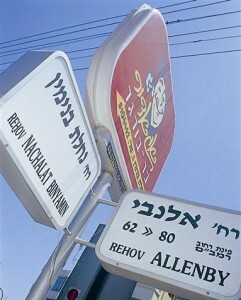 Just near the Carmel Market on the Nahalat Binyamin pedestrian walk. Arts & Crafts Fair on Tuesdays and Fridays when the artists themselves are offering their creations. My forever favorite artist (so far) in Tel Aviv is Chantal. 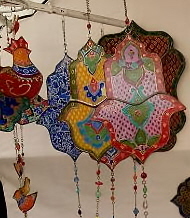 While strolling up and down the Nahalat Binyamin Art & Crafts Market, I found myself immediately drawn to a vendor with hanging hand painted glass Hamsas. I love hamsas and have a very fine collection, but these, these were very special. I tell Chantal that I love her work, “Yofi, Yofi!”, (beautiful) I say to her. I continued to gush on & on about how intricately detailed her work is and how I could never steady my hands to do such tiny exquisite paintings. Chantal, never missing a stroke of her paint brush, looks up at me and says, in that typical “straight forward” manner of the Israelis that I’ve grown to love, “Well, yes, that is the thing, isn’t it.” (um, Yea-ah, having a (very) steady hand and the creativity is the “thing” that makes her work uniquely Chantal’s. We celebrated our 30th wedding anniversary and renewed our wedding vows at Temple Emanu-El-Beth Shalom in Montréal, Canada. Montréalers say they have the best bagels in the world. I don’t about know about that, but while we were there we did have the best french toast bagels I’ve ever eaten. I’ve attempted to duplicate the recipe. I did a pretty good job too! 2. Heat 4 tablespoon butter and 4 tablespoon oil in a very large sauté pan over medium heat. Add the soaked bread and cook for 2 to 3 minutes on each side, until nicely browned and crispy. Place the cooked French toast on a sheet pan and keep it warm in the oven. Fry the remaining soaked bread slices, adding butter and oil as needed, until it’s all cooked. Serve hot with bananas & strawberries with yogurt & honey, or maple syrup or raspberry preserves & confectioners’ sugar. Gently mix together yogurt and honey. 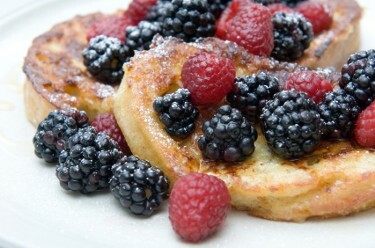 Serve over french toast with fresh fruit. Guten Appetit! Es Gezunterhayt! B’tayavon! Enjoy!! 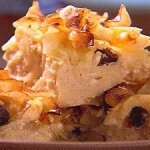 KUGEL is a famous Jewish dish, made especially by the Ashkenazi Jews of Eastern Europe. The word is Yiddish for ball, but it is sometimes translated as pudding or casserole, and related to the German Gugelhupf. Evidence exists that the dish was made over 800 years ago, though it has gradually been modified and improved upon over time. Many are used to thinking of kugel as a dessert, and you will certainly find lots of kugel dessert recipes. It can also be made as an unsweet savory side dish or entrée using different types of cheeses, mushrooms, etc. Kugels are a mainstay of festive meals in Ashkenazi Jewish (Jews of Eastern European descent) homes, particularly on the Jewish Sabbath and other Jewish holidays. Cook noodles following package instructions. Drain & set aside. In a (very) large bowl mix together all ingredients until cream cheese resembles cottage cheese. Add noodles. Mix well. Oil spray 9×13 inch pan or one of your choosing and pour in mixture. (Optional-sprinkle top lightly with cinnamon.) Bake @ 350 degrees F for at least one hour or until lightly golden brown and firm in the center. I usually freeze 1/2 of the kugel for later use. I don’t know if it’s the same for you, but the last thing I need to do is gain additional pounds from nibbling on the luscious thing all week until it’s all gone. It can be prepared weeks in advance, baked, and frozen. It need not be thawed before going straight into a 350 degree oven for an hour. I recommend covering it with foil before re-heating it in the oven.